Chauffeur wedding car Prague provides white BMW 7 Series. One of the best limousines you can have on your wedding day. When it comes down to your wedding you know that there must be no last chance changes. Beginning with the perfect venue, top-notch clothing for the main couple, menu worthy the royalty and finishing with the decoration and transportation, everything must be the best. To take some of the pressure off your shoulders, we offer you an exclusive transportation which will take your wedding day to the whole new level. 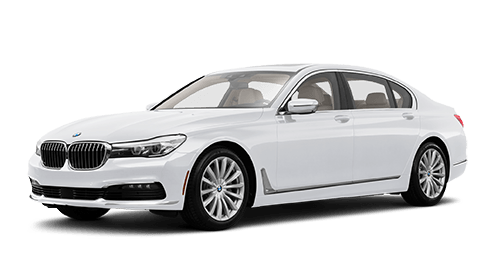 BMW is one of the most reliable manufacturers of amazing vehicles on the market so you can be sure that the luxury and style you deserve on your wedding, will be certainly accompanied by the best transportation. One of the worries regarding transport is the reliability and experience of the drivers. You don‘t want to have your day ruined by a someone who doesn’t know what to do, but you can rely on us in this matter. Our drivers are professionals who understand the importance of such day and would provide you with comfort, luxury, and safety for anybody being it the bride and the groom or the guests. If your goal is to make an impression you have certainly come to the right place. Moreover, we will take care of picking up guests from the airport and with professionals like us the experience of your wedding will be much more enjoyable. Arrival to the venue is a big part of the wedding and one must take it seriously. After all the guests will be talking about it for a long time so it better leaves a great impression. Besides that who would not like to have a shiny luxurious BMW 7 series in the background of their wedding photos? The more glamorous and elegant your wedding is, the better. Why not add something extra? BMW car is the answer. It is mesmerizing to find your wedding car in perfect condition, amazingly maintained. One just cannot say no to such car on such special day. If you have experienced a ride in BMW then you probably know about the comfort and luxury these cars have and in that case, no other words are necessary. And if you never had an opportunity to have a ride in BMW 7 series then your wedding day is the perfect timing. All in all that is amazing, however, the car is nothing without a chauffeur. When on your wedding day you are assured that you and your guests are gonna be taken care of by an experienced and friendly chauffeur, you can simply fully enjoy the best time of your life. Now you have no reason not to hire the White BMW for your big day. The wedding is one of the few occasions in your life when it is acceptable to go overboard, have everything special and the best. In 20 years when you will be showing your wedding photos to your friends, you will be so glad you went for that White BMW to add more personality and style to your event.